Day two. Post an awesome sleep-away camp adventure. And, along with my two-shades-browner, one-inch-taller son, I find myself once again disturbed by familiar unwanted guests in the house, albeit of the virtual nature. Two days ago we made the hike up to New Hampshire’s breathtaking white mountains to pick up my fourteen-year-old, Jake, and already I am yelling at him to turn off his video game. I know many of you have been wrestling with those oddly realistic animated sports stars and beckoning monsters for weeks now (weeks = eternity), and are desperately seeking some kind of remedy to get your kids off the screen, outside and on the move. If only there was a Vitamin O (“Keep in reach of children”) that would mentally orient our kids O-ffline and O-ut the door. According to the American Academy of Pediatrics, the average kid, ages 8-18, spends more than seven hours a day looking at screen media. Yikes! Of course, I am no Luddite, but for summer, the only screen kids should really use is sunscreen. Wow. Music to my ears! Jake slept in a open-air cabin under mosquito netting, played soccer and tennis every day, hiked to the top of Mt. Lafayette, kingpin of the Franconia Range, canoed up Baker Pond, lifted his voice to traditional camp songs, and ate whatever the camp cook ordered up, without complaint. He loved it. So how do we keep the screen-free, fresh-air high going? Much has been written about the value of a screen-free summer. And, increasingly, it is even more poignant in 2015 with our children tethered to their app-filled phones and consoles – distracted, dismissive and when they don’t get enough Instagram “likes,” disheartened. Boys and girls alike – we need an answer to that omnipresent screen. For insight, I turned to ‘America’s Worst Mom,” and author Lenore Skenazy ‘s controversial book, “Free-Range Kids” (a must read!). “Chores, games, and getting the heck out of the house were all a hallowed part of childhood until recently, and together they help develop the very traits we want to see in our kids: responsibility, confidence, and good cheer. The ability to find something fun to do without depending on Steve Jobs,” said Skenazy. Yes, it is so much easier to just switch on the tube, and/or allow our kids to absorb themselves in the head-down experience of engaging in the unending number of social media apps and games (and therefore not bother us). But, I decided to dig into my own hallowed childhood, before the advent of the Internet, to see what summer activities rocked my world. Here are a few ideas that came to mind – and some newly inspired ones. You’re welcome to ‘em! Bugs on fire: Bring out the scientist in your kid by investing in a magnifying glass and having your kids examine bugs up close – spiders, ladybugs, grasshoppers, crickets and daddy long legs are usually in plenty. The fascination is true, and so what if sometimes the sun is at just the right angle and your kid sets the bug on fire? Another science lesson! Premium mud pies and purified dirt. Relinquish your kitchen strainer and have your kids sift dirt – purifying it for the most tender mud pies around! With the left over “clean” dirt, either use it for the garden or do what my brother and I did and sell the purified dirt to your neighbors, door-to-door…a nickel a baggie! (My mom would hide in the house). Car wash! Have your kids wash the car in their bathing suits. I always loved this job as a kid, and they will too if there is enough soap and bubbles. Dog wash! Pull out the old kiddie pool and have them wash the dog – and themselves. The classics. Read a classic novel under a tree, like Charles Dickens “Great Expectations” and relish the eloquent dialogue and lack of “likes,” “ya knows,” “I can’ts” and “totallys”. (Okay, I know…I had to go there.). “Eat Everything Outside!” week. Celebrate the fact that all food tastes better al fresco and eat all meals on the picnic table. Added bonus? For clean up, all crumbs and spills stay outside! And, if you can afford it – send your kids away to camp! I spent many amazing years at camp that I will cherish forever. 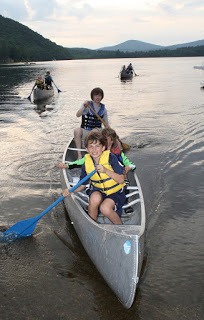 (Read my ode to Camp Hadar.) Sleep-away camp is all about having fun, making life-long friends and learning a little self-discipline and responsibility along the way. And, kids love to be taken care of by cool older kids as opposed to us boring, nagging parents. Next This Summer’s Media Tsunami Over the Way Women Speak: 4 Camps – Who Are You Bunking With?